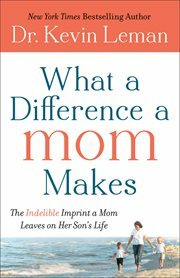 Publisher: [United States] : Baker Publishing Group, 2012. Page 28: "For the past several decades, society has been working hard to redefine men's roles and to emphasize the 'sensitive' man who is supposed to enjoy cuddling and talkfests, and basically act like a girlfriend would. But is that really who you want your son to be? A girlfriend? Or do you want him to be a real man..."
Page 30, in describing how a mother should make her son feel needed: "Why not give him some ways to help?... 'Fletcher, would you mind moving the couch for me? I'd love to vacuum under there tonight, but it's too heavy for me to move.'" I can't believe this book has a copyright date of 2012. Good riddance. Wonderful info! Wish I would have read it when it first came out and my oldest son was younger! Unfortunately, my wife found the author to be quite condescending. Mothers and Sons — Religious Aspects — Christianity.